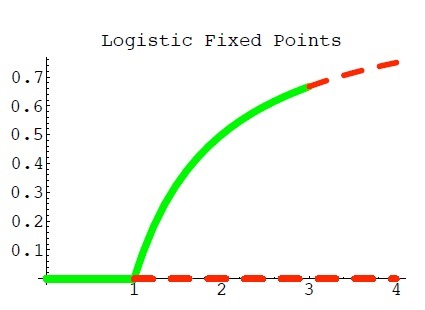 The green line corresponds to attracting fixed points and the red, dashed line to repelling fixed points. The graph is of fixed points vs . The fact that there are no attracting fixed points for indicates that the behaviour is more complicated when the growth rate, , gets large. We could have periodic behaviour and perhaps more strange, chaotic behaviour. We studied therefore the case where . We said that for , is symmetric about and is unimodal. We showed that has branches and hence period- points. In Week 7 we will finish of our study of the Tent Mapping and perhaps begin our study of the Doubling Mapping. I have emailed ye a copy of the exercises and ye have looked at questions 38, 39, 42, 43 for the Week 6 tutorial (assuming that ye were ready for Wednesday’s Test). For the Week 7 tutorial you should look at these first and then backtrack and look at questions 30-37. The results of the test will be revealed in time. The Concept MCQ will take place on Wednesday 26 February Week 8 in WGB G05. It will be a half hour test and starts at 10.25 and runs until 10.55. The homework will be given to you towards the end of the semester and I will give ye three weeks to do it. It will probably be on complex numbers and won’t be as long as last year’s homework. You will be given marks for the best two out of Test, Concept MCQ and Homework. If you find yourself stuck and for some reason feel unable to ask me the question you could do worse than go to the excellent site math.stackexchange.com. If you are nice and polite, and show due deference to these principles you will find that your questions are answered promptly. For example this question about finding a formula for the iterates of (x).